I had a very busy couple days and really need rest. Yesterday I fell backwards on the ice, like a cartoon character, two feet flying up in the air. Well I fell on my back and hit my head backwards. I did not sleep well and I am hurting today. I do not like to complain but I am feeling old and bruised. I am sure I feel better in a few days. Nothing broken, lucky this time. I sat around lots and got out some hand stitching. 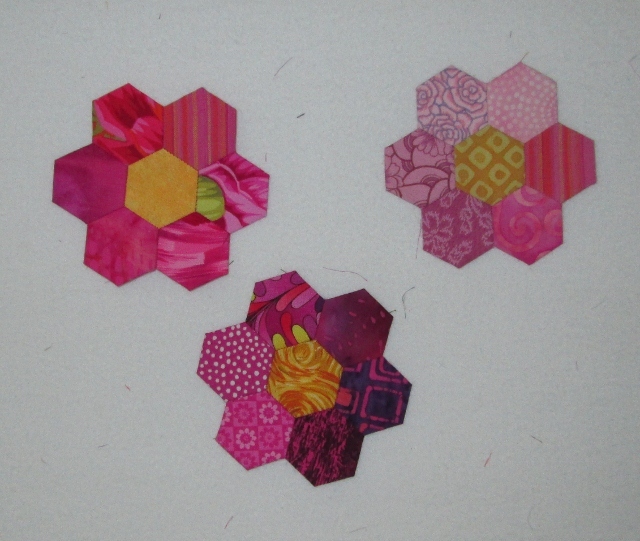 I got three little Hexagons flowers done. 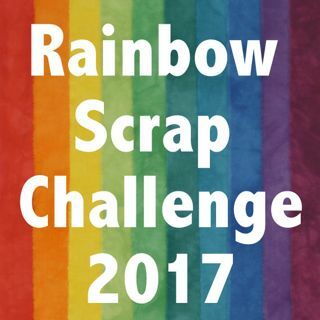 In part I am working on them for the Rainbow Scrap Challenge 2013. I started with some blue ones last August while camping. I have added this post to Kathy's Slow Stitching Sunday link. Go see what others have been working on by hand. This is the tin box lid I use as a tray for these little babies. I expect I will get a few more done before the end of the month. You are so lucky that you didn't break any bones in your fall! Rest up and enjoy your hand stitching. 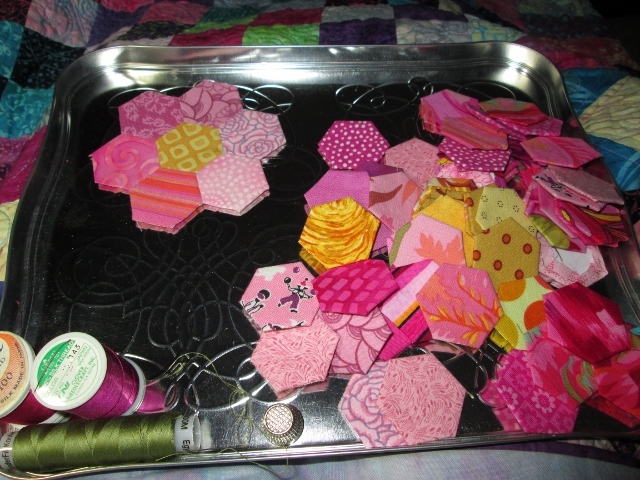 Such a pretty collection of hexies! Those flowers are so pretty. How scary on the fall...you are lucky nothing more than bruised and achy parts. Yours flowers are so pretty. I have a wooden box with a lid that slides that I keep all my hand stitching supplies in, I have told my husband in case of fire grab this box. It's nice to have a treasure chest. Ah. Hexagons. Me too. I see you are making flowers for yours all in one colorway, but with lots of different scraps. I'm not sure what I'm doing with mine. Mostly, I'm enjoying the process. ooooh, that sounds like it hurts! maybe a visit to the chiropractor is in order? take care! oh Cathy...it's been a few years since I've slipped on ice like that. Hope you are feeling much better today. Cute hexies. I am glad you did not seriously hurt yourself. Sounds like at least a couple days of resting and sewing are what you need for full recovery! Wow, sorry you fell but glad you didn't break anything! I fell last year on the ice and did the splits. OMG, you don't know how old you are until you are sore in places you forgot about! I am glad you didn't get hurt and hope you feel better soon. I love your hexagon flowers. I have a tin of those I work on occasionally. I guess I need to get it out and work on those too this year. Have fun and don't fall anymore! Cathy, so sorry to hear about your fall...and now the flu. You cannot cut a break. But your hexies are adorable. Great to have a hand project to 'fall' back on. Get well my friend.